NexentaStor is a fully featured NAS/SAN software platform with enterprise class capabilities that address the challenges presented by ever-growing datasets. NexentaStor continues to build on its position as the superior, open alternative to vertically integrated, proprietary storage offerings, provides customers the flexibility to select their storage operating system independently from the hardware it runs on. NexentaStor licensed features add incremental functionality and enhance NexentaStor's standard capabilities. In addition, these optional features can be installed without restarting NexentaStor or upgrading the entire system. Certified on a wide choice of industry standard hardware, NexentaStor helps organizations implement high-performance, cost-effective data storage solutions with features that include inline deduplication, unlimited snapshots, cloning and full HA support. 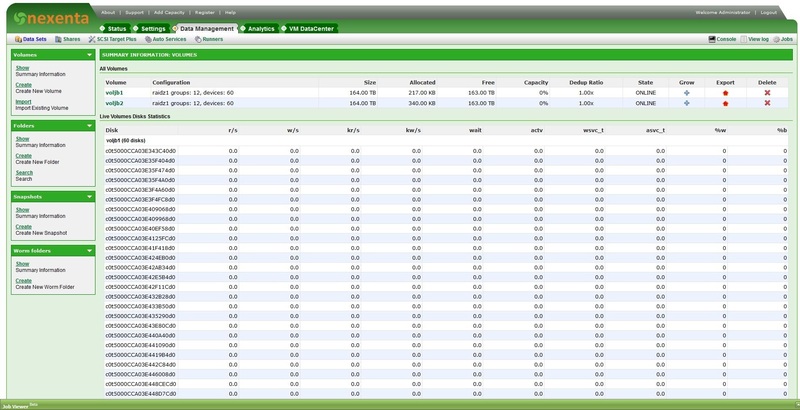 In addition, NexentaStor functionality includes full integration with hypervisors, even in mixed vendor environments. This solution can create shared pools of storage from any combination of storage hardware, including SSDs. It also delivers end-to-end data integrity, integrated search and inline virus scanning. NexentaStor also enables efficient one-click virtual machine and other storage provisioning. The power of NexentaStor is extended by the use of Nexenta's Licensed Features. These include namespace cluster, high availability clusters, OST for Symantec NetBackup and Nexenta Target FC. These also provide integration enhancements for management and administration with other 3rd Party products such as virtualization suites. Nexenta High Availability (HA) Cluster provides active failover capabilities for NexentaStor servers to eliminate a NexentaStor server as a single point of failure. The HA Cluster licensed feature supports both active / active and active / passive NexentaStor server cluster configurations. HA Cluster manages and controls the shared storage which is accessible from both NexentaStor servers. During failover scenarios, HA Cluster quickly and securely transitions services and data access between NexentaStor servers to ensure data availability. In conjunction with NexentaStor, HA Cluster helps storage administrators protect data in multiple ways, including mirrored RAID, data replication and metro area clustered failover via the Nexenta MetroHA solution. NexentaStor provides data protection for ZVOLs via inherent features such as replication and mirroring, managed via standard storage management policies.